Dealing with invasive species in our industry has become more and more common. Some of the more notable ones, such red imported fire ants, Africanized honeybees, Asian lady beetles, brown marmorated stink bugs and Formosan subterranean termites, to name a few, have become common, if not even daily, occurrences for us in the industry. Take a moment to look up only the list of invasive insect species, not counting mammals and reptiles, and it will blow your mind how many of them you deal with all the time. As the world becomes smaller through travel and commerce, the risk of new, non-native species being introduced into the U.S. is always a possibility. The Turkestan cockroach, Blatta lateralis (Walker), also known as the “red runner” or “rusty red” cockroach, is an invasive species found primarily in the southwestern United States. WAIT! Before you say, “Well, this doesn’t concern me; I don’t live in the Southwest,” read on. Turkestan cockroaches are a native species to areas of the Middle East through Central Asia. Their distribution includes countries like Afghanistan, Pakistan, Iraq, Iran, Saudi Arabia, southern Russia, and now, the United States. But, how much of the U.S. they have already moved to and how far can they go, we really don’t know. That’s the thing that can be fascinating and, to some degree, unpredictable when a non-native species is introduced into an environment. How will they adapt to environmental conditions to which they have not been previously exposed? Will the new conditions restrict them or allow them to flourish even more robustly than before? What effect does their emergence have on other established species? The Turkestan cockroach was first reported in the U.S. in 1978 at Sharp Army Depot in Lathrop, Calif. Shortly thereafter, in 1979, they were reported at Fort Bliss in El Paso, Texas. Other reported sightings through the early 1980s in Arizona and Southern California were documented, as far east as Fort McPherson in Georgia in 2005. OK, so let’s put two and two together. Middle East. Military bases. Yep, you guessed it. Transport of military equipment and supplies from the Middle East is the most likely explanation for the initial introduction. The next question is, “What will the potential distribution pattern across the U.S. look like?” Well, the distribution pattern could be literally as wide as the internet. Turkestan cockroaches have become popular with reptile breeders as a food source for their animals. You can go online and have 25 to 35 Turkestan cockroaches shipped right to your home for less than $10. (Except in Florida, apparently. They think they have quite enough cockroaches already!) The attraction of this species of cockroach is its hardy, easily maintained nature. It is also unable to climb smooth surfaces, and breeds rapidly in large numbers. This could be the first time in history that an invasive urban pest species is widely distributed through the internet by sales of live insects. So what’s the big deal? It’s just another cockroach, right? Not quite. The Turkestan cockroach has become the primary peridomestic cockroach in the Southwest United State by displacing the Oriental cockroach. This has been achieved in a relatively short amount of time, probably due to the Turkestan’s relatively short time span to mature from an egg to adult. In addition, the female Turkestan will produce many more oothecae during her life span than the Oriental cockroach. BIOLOGY. Adult females produce between 2 and 25 oothecae over their life span. The male and female nymphs go through five molts, maturing into adults in an average of 222 days. In lab settings, many of the adults live for at least 13 months after being paired together. These reproductive and life span rates under the right conditions may well outcompete other common peridomestic cockroach species, such as the smokybrown and American, as it has done to the Oriental cockroach in the Southwest U.S. In Arkansas, there has been a dramatic increase in sightings, as well as the size of the populations found since 2013. We went from two known locations (both near a U.S. Air Force base), to 29 cities, with some reporting multiple locations within the city, in 2017. I’m sure there has been some distribution of the species during this time; we also may have improved our identification process, which may contribute to the sudden apparent explosion in sightings. 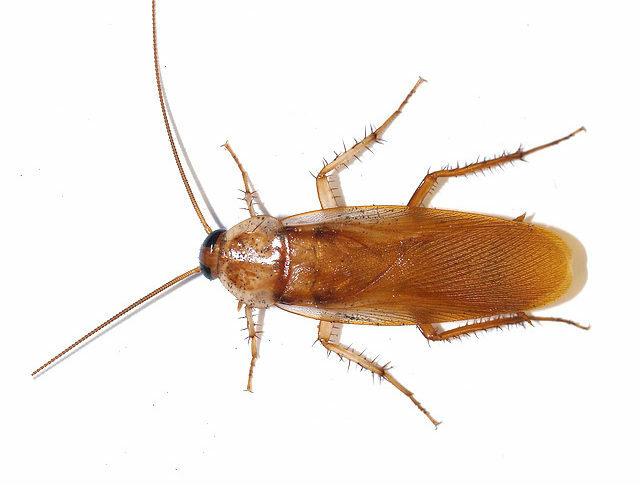 Most of the information published about Turkestan cockroaches lists outdoor locations as the most common places to find them, such as water meter boxes, center block walls, compost piles, leaf litter, potted plants and, occasionally, sewer systems. While this holds true in many cases, we are just as commonly finding them in relatively large numbers on the interior of structures, under and behind baseboards and door frames, wall voids, around hot water tanks and sinks, around floor drains and coolers of bar areas, and even in drop ceilings. Could finding large populations on the interior of structures be an adaptation to the regional environmental conditions? TREATMENTS. Some of the published material on Turkestan cockroaches, as well as interviews with PMPs in the Southwest U.S., claim bait formulations are readily accepted. In our region (Arkansas) where Turkestan cockroach activity has been found, we have had inconsistent acceptance of baits. Several different gel, granular and dry flowable formulations have been tested. One observation was that only the males would show any interest in the bait, while other populations seem not to be attracted to bait products at all. With bait formulations not performing reliably across the board, we have shifted our treatment strategy to dust formulations, primarily in harborage voids. This approach has provided the most consistent treatment results for our clients. However, the main drawback to this method is the fact that you may flush out 40 to 50 cockroaches that are each 1 to 2 inches long. CONCLUSION. In our industry, you never know what’s on the horizon. Maybe that’s what makes it so enjoyable for so many of us. It will be interesting to see how Turkestan cockroaches move across the United States over time and adapt. Could they possibly become a mainstay pest in our industry? Or, does Mother Nature’s checks and balances kick in and Turkestan cockroaches fade away into obscurity? Time will tell and lessons will be learned, of that there can be no doubt. Reference: Life History and Biology of the Invasive Turkestan Cockroach, Tina Kim and Michael K. Rust, Journal of Economic Entomology, Volume 106, Issue 6, 1 December 2013, Pages 2428–2432. Christian Wilcox, A.C.E., is the technical director for McCauley Services in Central Arkansas. He is chair of the Copesan Technical Committee, serves on the NPMA Technical Committee and is an ESA member. This Tech Talk article was originally published in the May 2018 edition of PCT magazine.